The Lovers (R) says face your conflicting beliefs – use your “free will” to examine and choose what beliefs you will accept. You achieve your sense of self worth from others or you recognize your responsibility to choose your personal reality as you desire it. Allow your inner, intuitive mind to guide you so that your ego can form and begin to function in the world. You cannot upset the natural drives within yourself – they are forces which must be recognized for what they are and dealt with the best you can. You can not evade, avoid or deny the way you are made. Your actions are causing others to feel unstable – seek a balanced expression of both the material and spiritual – combine your reason and imagination. When in a proper relationship – the total effect is called “grace”. There is a descent from your Higher Self that completely engulfs your personality in a blissful feeling – you can tell you are experiencing “bliss” when little things move your “spirit”. Your romantic immaturity and childish fantasies have involved you in a relationship which has become destructive. It is dominated by romantic or sexual addictions and this is creating difficulties for you in relating to other people. Indecision is not your friend. Seek that which represents the gifts of the spirit – apply to the “inner” principle and you will always get a true intuition for an answer. When you arrive at a higher level, there is never any need for display – truly generous people have no awareness of it – what they do is perfectly natural for them. Your Higher Self is always working and will eventually overcome any obstacles, as the complexities of a love affair resolve into a reciprocal working relationship of a permanent quality, flowing back and forth. In the first position: Much of your energy will go to helping others find their energy and the motivation to use it. In the second position: You may be burning the candle at both ends – an easy way to get burned. In the third position: Rare it is that we are told to let a love go, but such may be the case now. This may be a period where introspection and self-love is called for. To the artist, this means back to the studio rather than the gallery. In the fourth position: At one extreme, this tape is so ideal as to be deliberately, if subconsciously, unattainable. At the other extreme, you may have the non-ideal, the impossibility of true love or an actual distaste for intimacy and pairing as your tapes. This latter is serious, as it blocks all growth, emotional and spiritual and must be surmounted sooner or later, with less or more pain. In the fifth position: This is where the word preoccupied comes into good use. The mind needs more than this one track. At another extreme, these thoughts are against this archetype. In the sixth position: Too much or too little – both can cause disappointment and sadness with the sense of loss, as a piece of self missing. Accept this twist on an old parable: like the shepherd who leaves his entire flock to find the one lost sheep, the heart may neglect what is at hand to search for what is lost. In the seventh position: At one extreme, here comes true temptation – the impact of a full and throbbing heart on the rational business of mind. The advice here is to temper your emotions if you can find the wherewithal. At the other extreme, your libido is too low and you may be ignoring something that very much deserves your attention. Remember that this can be your own gifted talents. In the eighth position: At one extreme, the process will subvert itself in progress by trying to possess or even consume the very other it has come to “love.” Could indicate separation/divorce. 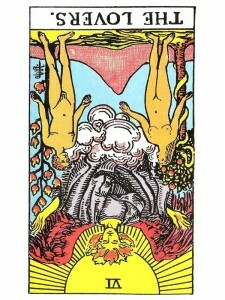 In the ninth position: Here may be the pain of intense love felt, not lost. At the other extreme, is the agony of unrequited or lost love. I learned and come to understand its meaning reflecting images that I’m living this story, I now see where I stand with my husband of 33 years of being together, why we never married, been by his side, went through the Emotions in every event he has gone through the but his shares none of it with me. I see where I stand with him and why he is rude to me, so I say to him to be very careful to what he is playing with and I’m calm when I say that to him. And thanks it’s easy for me to learn them. Thank you. Your site has the best writers (thinkers)? I’m glad to see you have updated to a mobile-friendly code. I always enjoy my time here.